In a nutshell, what is the U.S. Public Service Academy? 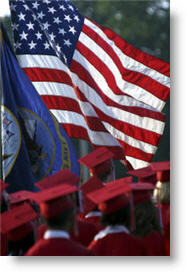 The U.S. Public Service Academy will be an undergraduate institution devoted to developing civilian leaders. Modeled on the military academies, the Academy will offer four years of tuition-free education in exchange for five years of civilian service following graduation. How many students will it serve? The Academy will serve roughly 5,100 high-achieving students from across the United States and the world. How will students be admitted? Spots for nearly 1,300 incoming freshmen will be allocated by state, following a congressional nomination process similar to that used for admission to the military academies. Nominees would compete against other nominees from their state, thus ensuring that each state will be proportionally represented in the student body. What kind of curriculum will Academy students follow? The Academy will offer a unique curriculum that combines a broad-based liberal arts education with an emphasis on service learning and international education. The combination of rigorous academic work with hands-on learning experiences will give our students the analytical skills, academic background, and practical experience they need to think critically and flexibly about the challenges of the twenty-first century. What kinds of jobs would Academy graduates do during their five-year service requirement? Academy graduates will spend five years serving their nation by working as teachers, park rangers, police officers, border agents, and other critical public service jobs at the local, state, national and even international levels. What if an Academy graduate wants to pursue graduate education? The Academy will follow the lead of the military academies and subsidize students’ graduate education in return for an extended service commitment. For every year of subsidized graduate education, students must add an additional two years to their service commitment. Thus, an Academy graduate who pursues a four-year medical degree will be responsible for serving the nation for a total of thirteen years following their graduation from medical school – the required five years, plus eight additional years. That decision ultimately will be up to Congress, but we feel that one site that makes logical sense is Washington, D.C. Our nation’s capital has tremendous opportunities for Academy students – internships where students would be able to get hands-on experience in public service; partnerships with government agencies that could provide speakers and visiting professors for Academy classes; easy access to research materials and subjects; and other concrete resources that would be hard to duplicate elsewhere. D.C. also would be a magnet for top faculty. About 70 cents per American per year. For less than the cost of bus fare, we can build a lasting institution sends a clear message to our young people – public service matters, and it matters enough that we have built a national public university dedicated to it. Who came up with the idea for a U.S. Public Service Academy? The Academy is the brainchild of two Teach For America veterans, Chris Myers Asch and Shawn Raymond. After having taught in the Mississippi Delta in the mid 1990s, Asch and Raymond teamed up to create a non-profit educational organization for at-risk teenagers, the Sunflower County Freedom Project. Now, they have set their sights on helping America give its young people more opportunities to serve their country in a meaningful way. 1)	First, recent events have inspired a younger generation and imbued many young people with a sense of civic engagement not seen in decades. Unfortunately, many of these students are priced out of public service careers because they rack up so much debt while in school. 2)	Second, we face a critical and growing shortage of public servants – as baby boomers retire, we will need more teachers, more cops, more air traffic controllers, more everything. 3)	Finally, we currently have no national undergraduate institution dedicated to developing civilian leaders and meeting our nation’s critical needs. We offer our young people outstanding, federally-funded opportunities to go to college and serve their country in the military, but none to serve as a civilian. How is this campaign being funded? This campaign is driven by the power of an idea, not the power of money. We have no lobbyists, no campaign staff, no high-priced office. We are funded by individual donors from across the nation. How realistic is this politically? The Academy is not a Republican idea, it is not a Democratic idea, it is an American idea. We believe that all Americans can agree that no matter the size, no matter the policy, our public institutions should work for the American people. With courageous leaders from both sides of the political aisle, we can create a lasting institution that will stand as a monument to visionary leadership. Americans are a can-do people, and we can build this Academy. Who is involved with this campaign? People who believe that national service matters and want to make America a better, stronger, safer place to live. We have a growing bipartisan board of advisors, as well as a growing network of volunteers from all across the country. Join us!